Latest News: A Tribute to Maurice Dean 1932-2018. On leaving school, he realised he needed a trade to make headway in life and finally managed to be taken on as an Apprentice Vehicle Body-Builder at the main employer in Leyland at that time,Leyland Motors, a Company renowned for manufacturing trucks and buses worldwide. They were a Company who had a progressive policy of encouraging outdoor activities for their employees in their spare time, and had a Sports and Social Section providing opportunities in activities such as Road Walking, Athletics, Fellwalking and Potholing..
Maurice became involved in all these activities, as well as starting a lifetime association with Preston Harriers. With his love of running and the mountains he became a leading fell runner in the early 1950's. The first Lake District Mountain Trial was run in 1952 and was organised by the YHA. With his friends from Leyland Motors, their team did amazingly well. The Club took the team prize with their three top finishers-Roland Moore-1st – Jim Woodhouse-3rd- and Maurice 5th. Our future club member and many times champion, the late Maurice Collett , finished 2nd in the event. The following year, at the 1953 Coronation year event, they once again took the team prize, this time with Roland Moore again the winner-Geoffrey Page-3rd-and Maurice-4th. They were presented with a barrel of cider as the winning team ! Maurice Collett finished 8th in that race. Like many of his generation, it was then time to fulfil his National Service commitments. Maurice served in the Royal Air Force, signing on as a short term Regular. He trained as an Airframe Fitter and spent most of the time in the troubled war zone of Malaya. After travelling thousands of miles to the other side of the world, he spent his first night in Malaya in the next bunk to the son of the YHA Warden at Hollows Farm in Borrowdale! Soon after demobilisation he settled down in Leyland and married Marian-a happy marriage which was to last over sixty years- their children Allison and John completing the family. When he became aware of the sport of Orienteering, he was involved from the very beginning, taking part in most of the early events. When he and most of SROC leading members were invited to represent England at the World Championships in France in 1965 he had to decline because of his work commitments supporting his young family. 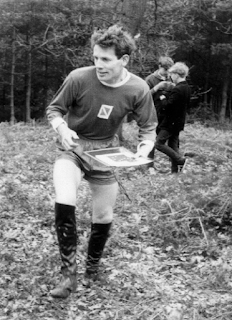 Another of Maurice s passions was supporting and encouraging scouts in the sport of orienteering. He gave years of such help and many of our club members were very happy to support Maurice at many of the larger scout events. Maurice was involved in the organisiing and planning of innumerable events both locally and in the Lake District-there have been many anecdotes within the club of moments of desperation and difficulty which we have all experienced- Maurice could always think on his feet and overcome difficulties-and always with good humour! Maurice also spent various periods of his orienteering years coaching Junior members of the club, often with great success. I think he teamed up with the late Judith Wingham in that capacity, herself a tireless worker for younger members. One memory of Maurice will always stand out for me. It was a Badge Event at Tockholes probably in the late 1970's and almost certainly organised by PFO. Although Maurice was very fast, the odd navigation error often cost him dear. Not so at Tockholes. I think he would be running M43 and he won the race by a wide margin-a perfect faultless run! I remember he sought me out after the race and asked me to take his photograph standing next to the results tape. He was rightly proud-there were finishers below him who were top class! But calamity struck. The Organisers downgraded his run to “non-competitive” on the basis that he had an unfair advantage because of his intimate knowledge of the terrain! Maurice wasn't happy but like the true sportsman he was he accepted the decision gracefully. I could only add that looking down the finishers below him there were many other local orienteers whose knowledge of the area equalled that of Maurice! For the last ten years of his working life Maurice was a Park Ranger on Worden Park, Leyland. He had a boundless knowledge of wildlife, birds, fungi even before he took the job. He became a respected authority on all such subjects with the wide range of locals and visitors who spent time in the park. In the year of his retirement, 1997, he proposed and helped to create a permanent orienteering course on the park with help from SROC club members including the re-survey and production of a new map. The course was opened in October 1997 and one month later there was a further award of the coveted “Green Flag” status for the park which was presented at a formal ceremony at which the club were represented. It was a fitting end to Maurice's working life. In more recent times and subsequent to his MS diagnosis, Maurice has enjoyed being taken to the annual Lake District Mountain Trial Event, The Three Peaks Fell Race, SROC Events and especially Preston Harriers Events by Peter Knott. He has also enjoyed Scout Orienteering Events and being pushed around Street “O” and Park “O” Events in his wheelchair- again by Peter Knott-a fellow M80 ! This year is the 40th Anniversery of the Chorley and District M.S. Society and Maurice had suggested organising a CATI “O”” Event in Worden Park. This is to be a fund raising event and is planned for 2nd September this year-offers of help to Peter. Maurice also had a long-standing friendship with Fred Bagley, which started in the Preston Harriers. Fred was a keen mountaineer and athlete and he went on to organise and win the first Three Peaks Race in Yorkshire in 1954. After losing touch with Fred for many years, they were re- united in 2011 after a painstaking search throughout the north of England! Maurice and club members attended the Three Peaks Race in 2011 when Fred had been invited to present the prizes. The day was rounded off well in the evening with a great gathering of friends to an evening meal at the Hill Inn, Chapel-le-Dale. Maurice also had a long association with the Chipping Show Fell Race, which he had instigated and organised. He had always been well supported by his friends from both Preston Harriers and SROC on race-day, and he carried on organising the race well into the times when he had lost much of his mobility through his progressive illness. One of Maurice's great ambitions was to write the History of Preston Harriers. He had done decades of research and copied hundreds of documents. Over the past year he had made some progress in getting together a team from the Harriers to try to undertake the task- directing operations from his home in spite of his great difficulties with his progressive illness. The Team he created to accomplish the task will now hopefully achieve completion. Maurice's grand daughter Phoebe is a talented athlete and showed much early promise in both track running and junior cross country and fell running, following in her grandfather's footsteps. She can be very proud of her grandfather's lifetime achievements. Maurice has been a very dedicated member of SROC for fifty four years and has made a telling contribution over the years in a Club which has lived up to its historical significance of being the first orienteering club in England. Peter Knott and Roy Woodcock. Maurice's funeral is at 1.30 pm. on the 14th August 2018 at Charnock Richard Crematorium. Chorley and District MS Society via the Funeral Director; Harvey Funerals Ltd.
5 Balcarres Road, Leyland, PR25 2EL. Tel; 01772 622203.